Think Again Before You Throw Away Your Use Soda Cans! These are angel ornaments or so we can say. Made out of soda cans, they look immensely creative. Hang it on your Christmas tree or your windowsill. This will definitely gain you some praise for putting your used soda cans to a good use. This is a handy and brilliant way of making good out of junk. These adorably decorated paint cans could be used to organise your study, kitchen or bathroom. Decorate used paint cans with bright fabrics, colours and buttons to make them look good as new. Doing this will save you a bit of money and also make a corner in your house look colourful and in vogue. Well, this lady is sure going gaga about having done her bit for an environmental cause. But then it really is cool to wear a pair of earring made out of the top pull tabs of soda cans. Try them on and let us know. 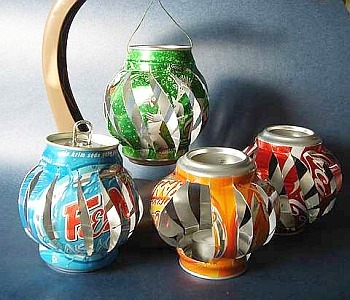 Adorn your house with these li’l can lanterns made out of the soda cans. Hang them on your study table, in your balcony or near your bedpost. When the soft light from these lanterns will glaze out, they will only be spreading shimmer of your creativity. Look at the image closely. What do you think it is? If you have run out of candies, refrigerate your vegetables in it or use it to store your stationary. A pop top pull tab basket for all purpose. And it looks stunning too! Uber cool, is it not? Liked it? Let us know in the comments below. If recycling the junk metal looks like a task, leave it to us. Visit us and let us serve you.